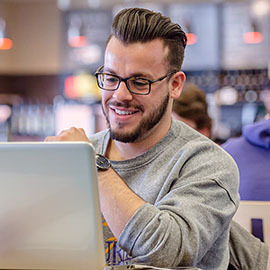 The new website for students is your online home when you’re at Laurier. Find everything you need from academics to student life, fitness and even tech support, all under one digital roof. We drew input from nearly 1,000 students while building the site to ensure it reflected what mattered most to you. And we heard you loud and clear – less clutter and easier access to the critical information you need to succeed in your studies, all while taking full advantage of everything life at Laurier has to offer. Quickly access what you need the most using the My Laurier tab – including your timetable, Quick Links to your favourite sections and Calendar feeds. To access these enhanced features and set a number of preferences to customize the website, login with your @mylaurier username and password in the My Laurier tab. When you first login, walk through the four-step profile wizard to set your preferences – including home campus, level of study, and customized quick links. From there, we’ve got you covered. Every time you sign-in to the website, the content most relevant to you will become even easier to find. For example, set your campus to Brantford to have all Brantford specific content display first as you navigate pages with campus tabs. Don’t worry, you’ll only ever be one click away from altering this feature by navigating to the My Laurier tab and selecting Manage. Another bonus? Once you’re signed into the website, you can go directly into your Webmail, My Learning Space, and Library accounts without having to re-enter your credentials. We want you to find the information you need when you need it. Dig into sections of the site that are built around your activities as a student. Wondering what intramural leagues are offered? Check out the Wellness and Recreation section. In need of writing support? Find everything you need under Studying and Academics. Each month we’ll also feature a range of articles (like this one!) on the homepage under “What you need to know” to highlight timely topics or reminders. Have a pressing question or idea for an article? Get in touch with us. Great campus stories and announcements can also be found throughout the site, both on the homepage carousel and with most academic programs. Tip: Set your academic program as one of your Quick Links to stay on top of what’s happening in your area. Even if you’re on the go, the students website is designed to go with you. Whether you’re on your desktop, tablet, or smartphone, you’ll always have student information at your fingertips. We’ve also cleaned up search, weeding out much of the outdated clutter, improving the quality of results. Find what you’re looking for and have confidence you’re in the right place. Whether you can’t find what you’re looking for or have comments on the new design of the student website – we want to hear from you. We designed the current students website based on what you want to see and how you want to find it, but we know it will take a bit of time to get used to! Check out the MyLaurier tab to find your quick links, including: webmail, My Learning Space, LORIS, the library and academic dates. Can we help? If you can’t find what you’re looking for or if you have some feedback for us, email webteam@wlu.ca.